Bougainvillea is a beautiful and well-liked tropical plant that grow vigorous vines filled with papery blossoms in a variety of colors. Although many gardeners grow bougainvillea directly in the soil, some also grow smaller bougainvillea in containers or hanging baskets. When a gardener chooses to grow bougainvillea in pots rather than the garden soil, it is not be difficult to keep the bougainvillea plants happy and thriving as long as there is abundant sunshine and regular fertilizer. Fill the container to the top with potting soil and place the bougainvillea plant into the container. Pat the potting soil around the base of the plant and give it a generous watering. Bougainvillea plants thrive most abundantly in containers where they are root bound. Place the container in a sunny location, either hanging the basket or finding a spot for the container. Do not place a container directly on the ground. This is because during the time the container is on the ground, the roots will grow out the drainage holes in the bottom of the container and when you move the container, you will damage the roots. Instead, place the container on a trivet or pedestal of some sort. Additionally, do not use a saucer under the container because bougainvillea roots do not like sitting in standing water. Water the bougainvillea as needed to keep the plant from wilting but no more than this. Do not over-water; allow the soil to dry between watering. Fertilize the bougainvillea every time or every other time you water by mixing the fertilizer with water according to package recommendations for the container size. Prune bougainvillea to control the growth at any time of year since this will not affect blooming. Remove new growth to encourage the bougainvillea to grow out rather than upward. If the bougainvillea grows larger than you would like, trim back the branches more drastically. Trim the bougainvillea back drastically before moving the plant inside for the winter to encourage bushy growth the following spring. Bring the bougainvillea plant inside when the temperature nears freezing because bougainvillea will not tolerate frosts. If you place the plant in a sunny location, it might continue to grow all winter without going into a dormancy stage. If you place the plant in a shady location, it could go dormant. If the bougainvillea becomes dormant, water the plant only enough to keep the soil lightly damp. 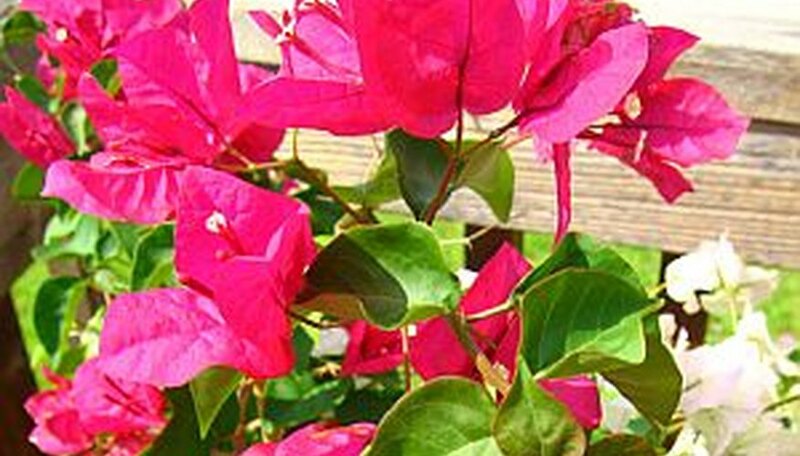 If the bougainvillea continues to grow over the winter, fertilize it every four to six weeks. If the bougainvillea becomes dormant, do not fertilize it until it begins to grow again in the spring. Place the bougainvillea plant back outside in the spring when the weather warms. Resume the same watering and fertilizing routine, and the plant should begin blooming again quickly. How Can I Tell If Bougainvillea Is Dead?